Pro sports rulebooks are fascinating things. They’re living documents, changing constantly as new rules are added, others are dropped, and still more are clarified and adjusted. But despite that, most of the rules are decades old and familiar to even novice fans. We never actually read the rulebook cover to cover — we’d never need to. We all know the basics, and figure that the rest are just minor details. And that’s all true enough. But fans really should take some time to browse through the rulebook every once in a while, because there’s all sorts of weird stuff in there. Rulebooks are rarely cleaned up, so stuff of indeterminate origin can linger for decades. Rules you’d think would be simple can go down a rabbit hole that lasts for multiple pages. And then are the exceptions, loopholes, and special scenarios: paragraph after paragraph of increasingly specific language covering situations that, in some cases, have never happened. But at some point, somebody somewhere was concerned enough to add a line to the rulebook, where it will probably stay forever. 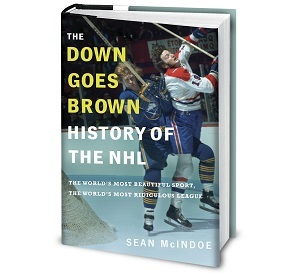 The NHL is no different, with many of its most common and well-known rules coming with a “Yeah, but … ” that most fans have never heard of. So today, let’s get out our trusty copy of the rulebook and dive in as we hunt for those hidden loopholes that rarely — and in some case never — come up in actual games. Here are five rules that you definitely know, and the weird exceptions to them that you probably didn’t. 1. If a player can’t serve his own major, his team must put someone in the box to replace him. There are all sorts of situations in which a player might be assessed a major penalty that results in a power play for the other team, but that he can’t actually serve by physically sitting in the penalty box. Maybe the offending player is a goaltender. Or maybe he was ejected, or injured on the play. In those cases, fans know the drill: The offending player’s team has to send over a player to serve his time for him. It’s usually a one-dimensional offensive star who doesn’t kill penalties anyway and can provide a threat to score on a sneaky breakaway once he’s out of the box. But while teams do indeed have to put a player in the box, they don’t actually have to do it right away. Rule 20.3 makes it clear that a team “does not have to place a substitute player on the penalty bench immediately”; it’s completely legal for them to keep their entire bench intact by just leaving the box empty when the penalty starts, and leave it that way as long as they like. During any stoppage in play before the penalty ends, they can send somebody over to serve whatever’s left of the penalty. Of course, there’s a slight flaw in that sort of plan, and it’s the reason teams almost never try this particular move: If there isn’t a stoppage, and the power play ends before you can get somebody into the box, you’re pretty much screwed. With nobody to come out of the box, the power play would continue indefinitely, or at least until the next whistle. You can’t get to even strength by having a guy hop over the boards from the bench — he has to come from the penalty box. And to make matters worse, you’re not even technically considered shorthanded anymore, so you can’t ice the puck like you would on a typical penalty kill. So does it make sense to do it? No, not really. But the rulebook says that you could, and that’s what really counts. 2. A player may not play the puck with a broken stick. The broken-stick rule is one that most fans know well, even though it doesn’t come into play very often. If a stick breaks, you have to drop it immediately. If you don’t, it’s an automatic minor, as per section 10.3 of the rulebook. Maybe the most memorable recent example of the rule being called came two years ago, when Ryan O’Reilly’s quest to become the first player in 33 years to go a full season without taking a single penalty ended when he was too slow dropping a broken stick in Game 74. But there’s an exception to the rule. Two of them, in fact, one for each team: the two goaltenders. Goalies don’t have to drop a broken stick, as per Rule 10.4. Both sections on broken sticks are worth a quick read, because they’re filled with weird exceptions and clarifications that most fans have probably wondered about at some point. For example, players can hand each other replacement sticks, but it’s a penalty if anyone “throws, tosses, slides or shoots” one. A skater can give his stick to a goaltender, but not vice versa. A player who has a stick thrown to him from the bench doesn’t get a penalty; the thrower does instead. And my favorite random detail: While play is still going on, a “goalkeeper whose stick is broken or illegal may not go to the players’ bench for a replacement but must receive his stick from a teammate.” I’m sorry, but if a goalie wants to sprint to the bench and grab a replacement stick on the fly, I think we should let him. Hell, we should encourage it. I can’t believe Ilya Bryzgalov never tried that.